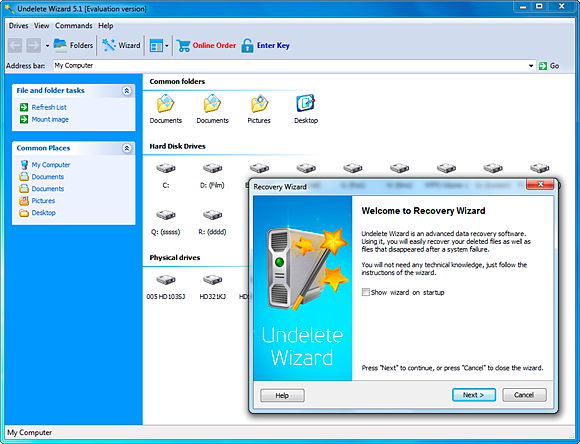 Undelete Wizard provides a guided recovery wizard to restore files and folders. Wizard Recovery Company announces the release of Undelete Wizard, a step-by-step data recovery solution for lost and deleted files. Undelete Wizard makes file recovery easy, providing a guided wizard to help users undelete deleted files and recover documents lost after a system crash. Undelete Wizard undeletes files removed from the Recycle Bin and recovers files and documents from damaged and corrupted disks and partitions. Supporting FAT and NTFS, Undelete Wizard works in all versions of Windows from Windows 2000 to Windows 7. Undelete Wizard differs from simple undelete utilities in many ways. Being extremely simple to use, Undelete Wizard provides a guided recovery wizard to restore files and folders. Live Preview shows full previews of files being recovered before saving them onto the hard disk. The preview works in both free and licensed versions of UndeleteWizard, and is a great way to reassure users that the files being recovered will be restored indeed. Unlike competition, the Undelete Wizard Live Preview feature never dumps binary data, calling it a ‘preview’. Instead, Live Preview recognizes and displays over 200 types of files in a what-you-see-is-what-you-get fashion. The technology works entirely in the RAM, and does not writes anything onto the disk being recovered. Undelete Wizard is not only simple to use, but applies powerful algorithms to greatly increase chances of successful recovery. Smart Scan allows Undelete Wizard get ahead of competition by recovering files that no competitors can recover. Smart Scan analyzes both the file system and the surface of the disk, ensuring that no single bit of information slips though unaccounted. The technology combines information obtained from the file system and the disk itself in order to determine the exact beginning and end of each file. Supporting over 200 types of files, Smart Scan ensures that most important files and data are recovered. The technology recognizes many types of office documents, email messages, digital images, music and video files, databases and compressed archives. Download free of charge evaluation version Undelete Wizard.